Read the next 29 entries on my new page 30 by 6 x 6! Resurgence is my renewal. 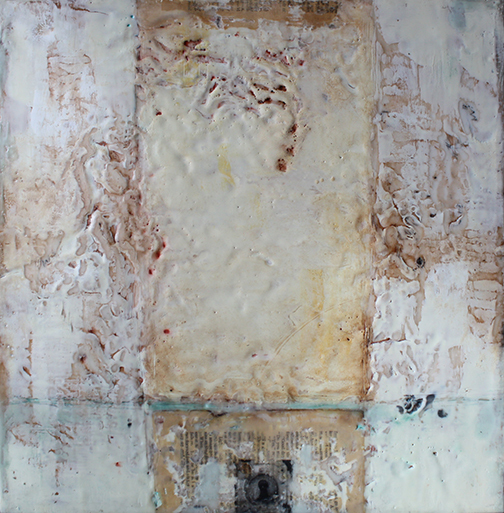 I created this piece during a major milestone in my life, the transition from being a corporate graphic designer to becoming a full-time artist and encaustic painter. Resurgence is the growth that occurs after a period without it; rising again into life, activity, or prominence. I was inspired by this personal experience of courage and rejuvenation. For the first time in more than ten years, I am free to be me. I am free to create what is naturally within me and I am motivated by what each new day brings. I felt this growth through every new layer of melted wax. It embraces this journey of perseverance and strength, revealed through a landscape of color and light. The soft, earthy color palette expresses the quiet and peaceful state of mind, just as a calm wave rolls in on the beach. As the wave approaches the shore, the energy is gradually spread, just as my personal progress leads me from one stage to another. CJ, Molly and Ashley Wellinger, commissioned this piece for their Mom on her birthday. It was an honor to create this painting for Mrs. Wellinger and her family. I look forward to seeing it placed in their home in California. Thank you again for this incredible opportunity! Below is a slideshow of pictures I captured during the entire creative process. I was inspired by the season changing into spring. Spring refers to the ideas of regrowth, renewal and resurrection. Each layer of melted wax holds the foundation that encourages new growth. 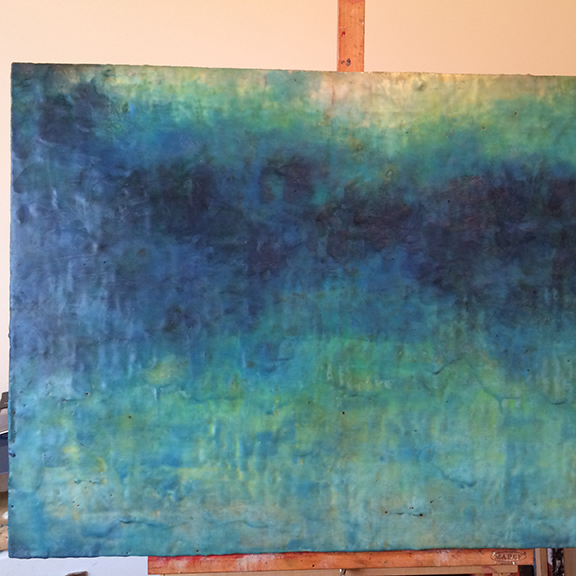 Blue and green pigments express a feeling of peace and rejuvenation, revealed through a landscape of color and light. The glimpses of red represent the two cardinals that I always tend to see in times of need. I believe the cardinals are both the spirit of my grandparents and a constant reminder of the importance of my faith. This piece was commissioned by Dr. and Mrs. Rousseau, great friends of our family. Spring Lake is now residing in Dr. Rousseau's office in Michigan. It was a huge honor to work on this project for them and meant so much to me! It's amazing how much a piece evolves and changes with every added layer. I took snapshots along the way to share my process with you. The slideshow below shows the many layers of wax and paint that go into a finished piece. What a great show at the Fine Arts Building last Friday! It was the opening reception for the GREEN Exhibition with two of my pieces and FUSEDChicago member's work. It was fascinating to see how each artist interpreted the word "green" and how they applied it to their work. My pieces probably had the least amount of actual green in them! Green reminds me of nature and specific places I've visited. 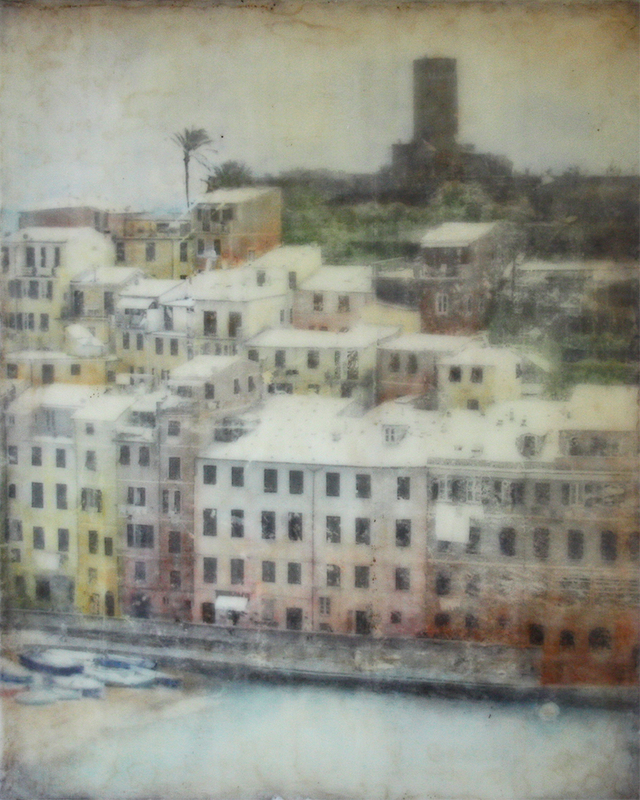 In both of these paintings I used small scale image transfers with my own photography, using images from my trip Cinque Terre, Italy in 2009. The lock image used above in Hope Within was captured on a nature hike in Manarola, seen on a rustic old door with a vibrant, beautiful green color. In Changed (seen below) I used an image transfer of olive tree branches over looking the cliff along trail in Riomaggiore. I am happy to say I am going back to Italy this April! I am lucky to go back to Cinque Terre, Florence and Chianti. There is no doubt I will flooded with inspiration, ideas, and pasta! :) Now more than ever, it's very apparent to me how much nature, travel and love for Italy inspires me work. I feel a new series coming on! It's been a few months since my last post due to a very important addition to my family! My husband and I welcomed home a bloodhound puppy named Harvey in early November. He is the sweetest boy, such a loving cuddly puppy. Just this past weekend was the first time Harvey sat with me in the studio and took a nap! He is 6 months old and already over 80lbs :) I love that he wants to be near me and especially while I paint. We've been working up to that and trusting him to make sure he doesn't try to eat anything that could be toxic. I'll have to get an extra dog bed so he has his own place to lay down so I can get work done! 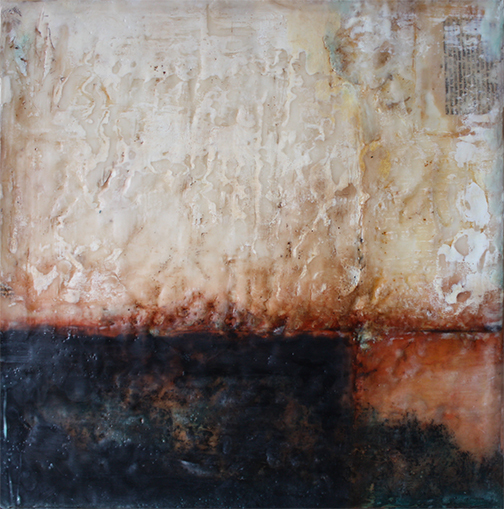 Brave Path, encaustic on panel, 12" x 12"
Lately I've been trying to paint intuitively, letting go of fear and any preconceived ideas of what it is supposed to look like. Through this fearless approach I am discovering my personal self-expression and my ability to let the composition unfold naturally. As I said in a previous post, I am damaging the painting (with new techniques and tools) to give the layers of wax something to respond to. Every mark, every crevasse and line leads me around the composition and I am reacting to those marks. Through this process I am discovering the subject matter and how it emerges from within. 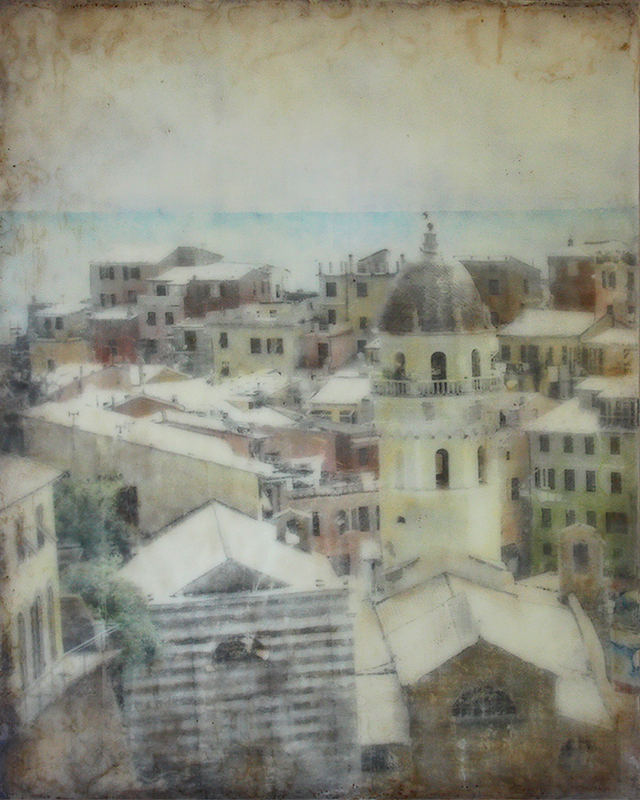 Faded Wall, encaustic and pigment stick on panel, 12" x 12"
I recently visited Paris for a special anniversary trip with my husband, Drew. It was my first time in France and it exceeded all of my expectations. Italy is (and always will be) our favorite, but we've tried to branch out into other countries like Greece (honeymoon) and now France. Travel changes everything. Not just about my work, but how I see the world in general. I am inspired and fascinated with other cultures and places in history. I am obsessed with taking photos and gathering as much inspiration as I can. I am interested in textures, colors, landscape and nature -- plant life, earth and rocks. The rugged textures, urban places, graffiti, old walls and eroded paths. Images pass through my mind and influence my creation and choices in the studio. Since returning home, I've been painting based on the memories of our trip. I will post a few photos of my inspiration to follow. A beautiful show at the Morpho Gallery last evening! My two works are on each end in this photo, Space Between and Before the Light. 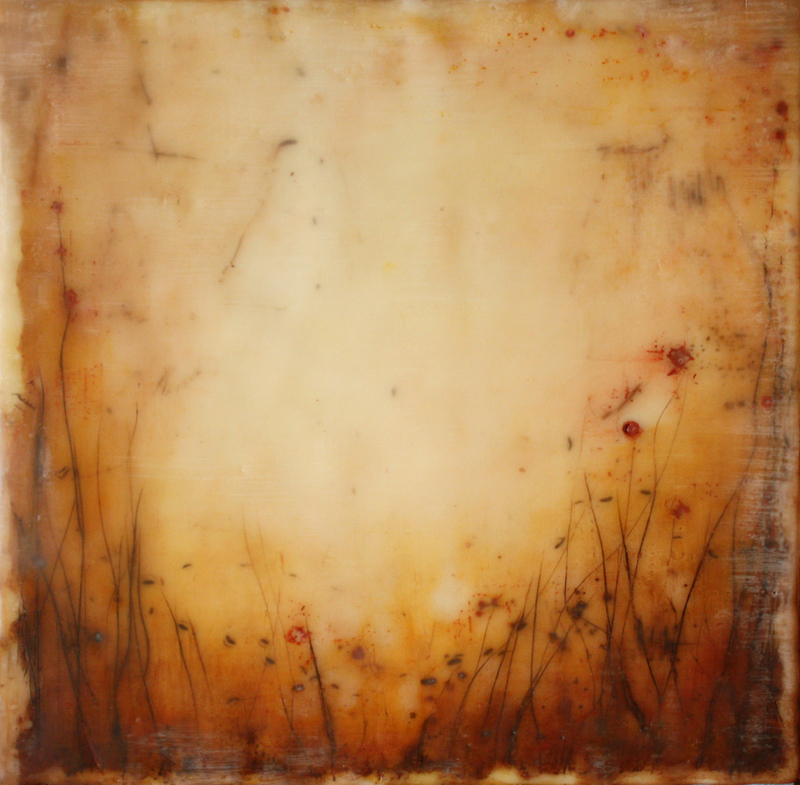 It's always inspiring to see how other encaustic artists use the medium. Everyone has their own unique style and it's fascinating to observe how many different ways you can use wax. The possibilities are endless! 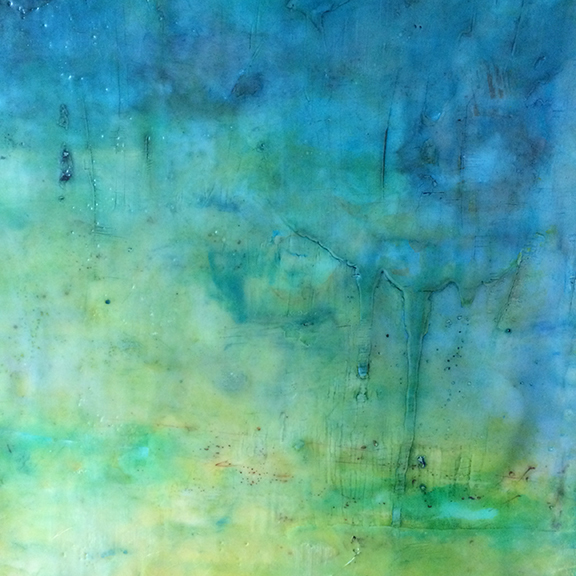 Go check out the Wax('in)Blue: An Encaustic Exhibition the entire month of August at the Morpho Gallery in Chicago. 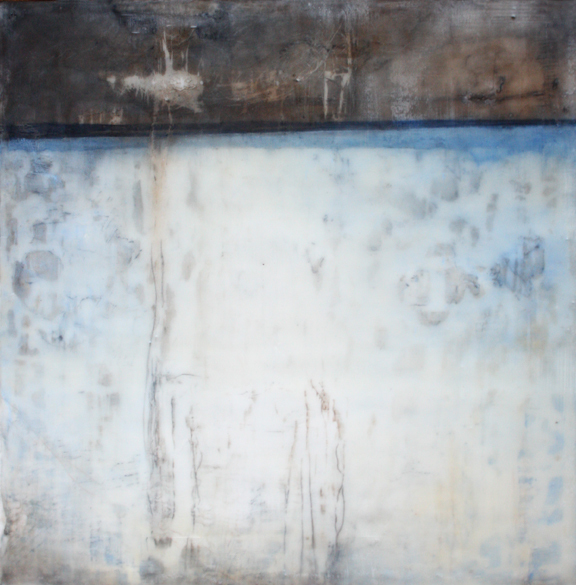 I am thrilled to be a part of the Wax('in) Blue: An Encaustic Exhibition at the Morpho Gallery in Chicago, August 10 - 31, 2013. Several works from FUSEDChicago artists will be on display, as well as two of my new paintings, "Before the Light" and "Space Between." 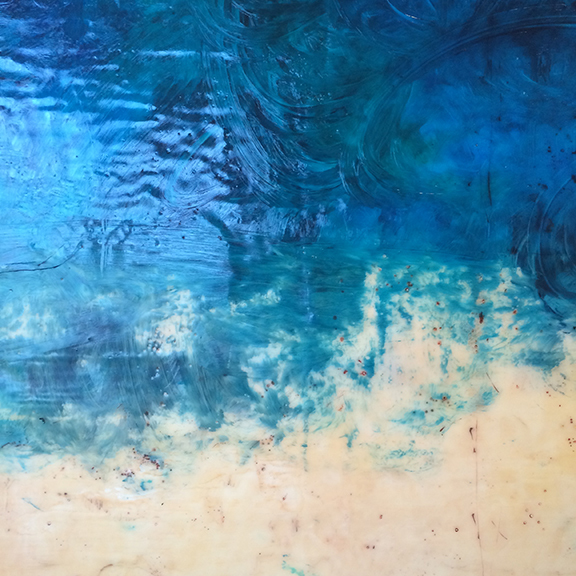 A few weeks ago I was lucky to attend the Encaustic and Pigment Stick Workshop with artist Shawna Moore at the Zhou B Art Center in Chicago. I learned a TON! So many new techniques and tips that will help develop my ideas. It will forever change the way I paint. The techniques she taught open up my eyes to something new, a new way of working and applying wax. The process gives greater depth and transparency -- something I've been exploring and practicing lately. 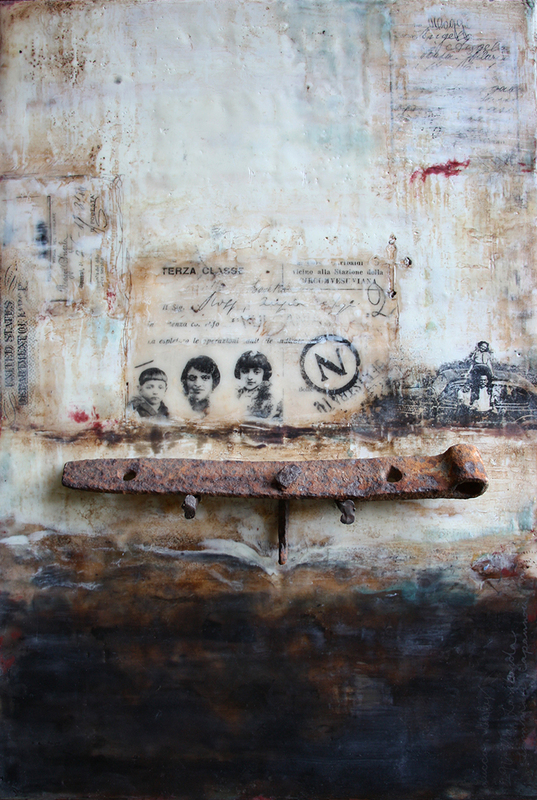 The use of oil paint and pigment stick give an infinite number of possibilities with layers, color and mark making. I am especially intrigued by mark making techniques. Pounding into the wax with various tools and objects, rubbing pigments into marks and revealing them as each layer builds with transparency. One of my favorite thoughts, Shawna expressed "damaging the painting will give it flaws you can respond to." New techniques and new inspiration! I have so much to explore and can't wait to discover my work again. Thanks to Shawna Moore and Jenny Learner for hosting an incredible weekend! I look forward to participating next year. Blogging is a new experience for me. My goal is to share my journey as an artist. My life, my process, and my progress. As I grow and change, it will evolve with me, and so will my work. While this website, blog, and social media sites will help me share, it's only an extension of creating art on a day to day basis. My ultimate goal is to be a great painter.